Advitech's new project, within its business intelligence activities, is a collection of Reports focused on the active pharmaceutical ingredients (APIs) world: APIsTRENDS. 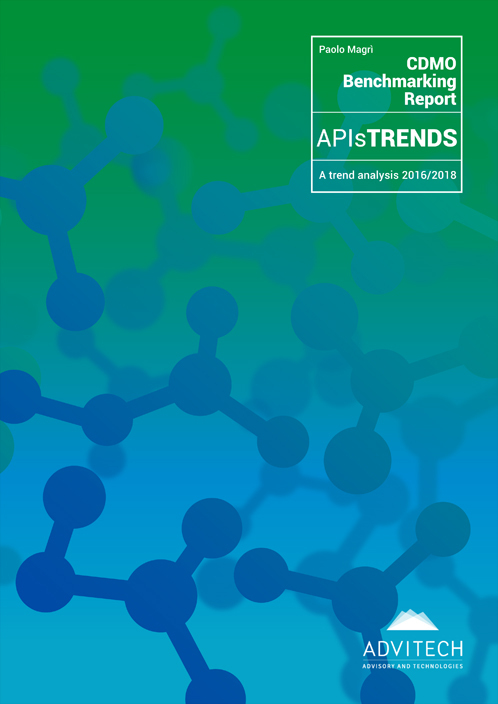 The first issue of the APIsTrends collection is CDMO Benchmarking Report - Baseline analysis. Benchmarking of CDMO companies active in small molecule APIs. New coming updated editions will enable to outline the main trends in this industrial sector, but this first CDMO Benchmarking Report will be an indispensable starting point to evaluate the market value of active pharmaceuticals ingredients (APIs) which is not so visible. The global contract development and manufacturing organization (CDMO) market is currently experiencing a constant growth and increasing interest in the healthcare world. The rise of CDMOs is a key aspect of the pharmaceutical industry's evolution over the past decades, where two-thirds of pharmaceutical manufacturing is outsourced. However, despite the wealth of information publicly available, it can be difficult to extrapolate the data required to make informed decisions about outsourced manufacturing, or investments in this sector. 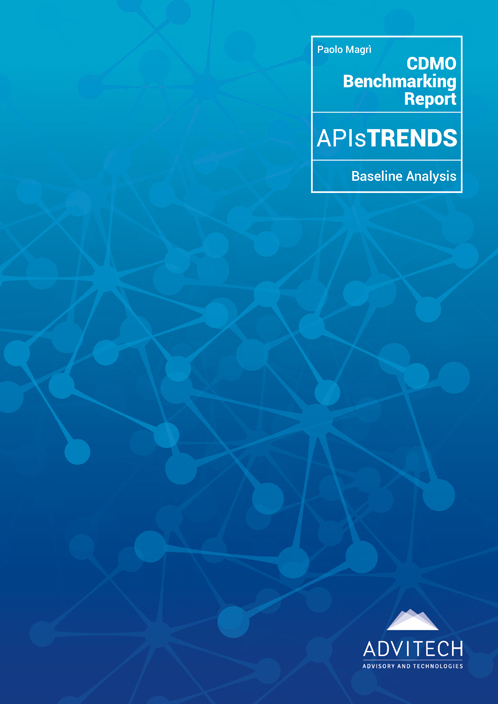 To meet this need address we at Advitech have decided to conduct the first benchmarking study on API CDMOs, starting by a baseline analysis according to 2016 data. The work is structured in two parts: one with an evaluation of the reference market value of drug substances produced by CDMOs. In fact, while the market value of finished dosage forms (FDFs) manufactured by CDMOs can be relatively easily assessed, values for APIs are not as visible. Therefore, to obtain an estimated value of the market pertaining to the subsequent benchmarking study, we performed a series of extrapolations from a range of publicly available and published data. The analysis provides an insight, placing an actual figure on the global market for drug substance APIs. The second part is a benchmarking study where 27 companies were chosen due to their well-established role as contract manufacturers and small molecule API capabilities. The selected companies were mainly headquartered in Europe or in the US, although two best-in-class companies in Asia were also included to provide additional perspective. Paolo Magrì is Senior Vice President Business Development at Advitech Advisory and Technology. He is currently President of the US Drug Chemical & Associated Technologies Association (DCAT). Mr. Magrì has over 28 years of experience in the active pharmaceutical ingredient (API) sector. Prior to joining Advitech, he served as Vice President of Business Development at Infa Group. During his tenure (2005-2016), Infa grew by acquisition to include sites in Italy and Spain, and a contract manufacturing division. Prior to Infa, Mr Magrì served as Marketing and Sales Director at Sicor and in Teva's API division, after the acquisition of Sicor in 2003. His strong track record in the industry also includes previous roles at Archimica/Pro.Bio.Sint. and Fordras. Mr Magrì earned his master's degree in Chemistry and Pharmaceutical Technology from the University of Milan, Italy.